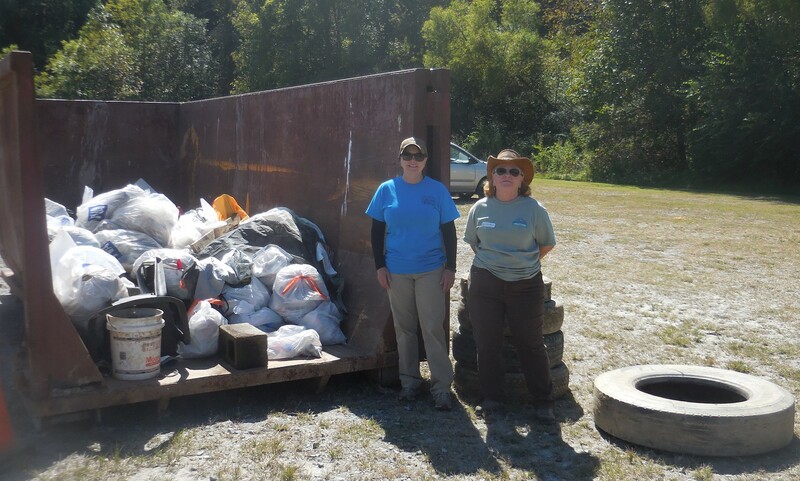 Trout Unlimited’s Beth Skillman (left) and Lynn Brincks (right) stand in front of the trash volunteers hauled out of the Toccoa. 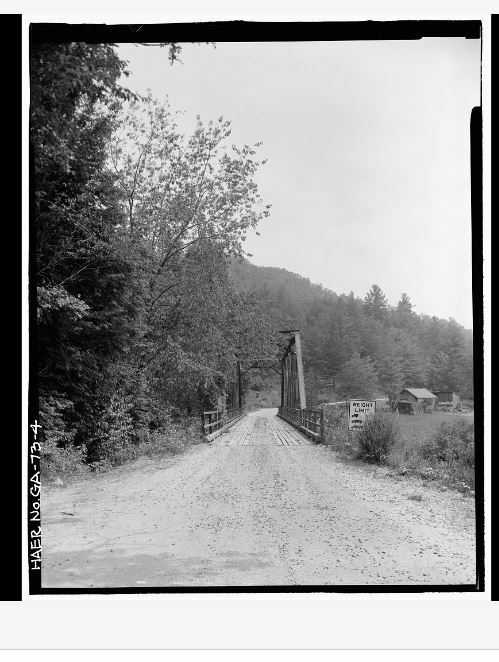 In earlier years, the trash haul from the Toccoa included a partially submerged sofa, washing machine, toilet, buggy, tires so laden with silt that they had to be dug out of the river bed. This year the strangest thing pulled out of the Toccoa was a microwave. Still there were hundreds of pounds of cans and broken bottles, paper plates and party trash, clothes and coffee mugs and at least seven tires. Cub Scout Pack 432 pulled out fish hooks and fishing lures from a popular swimming site Dry Branch Creek. Everyone brought back yards and yards of fishing line. 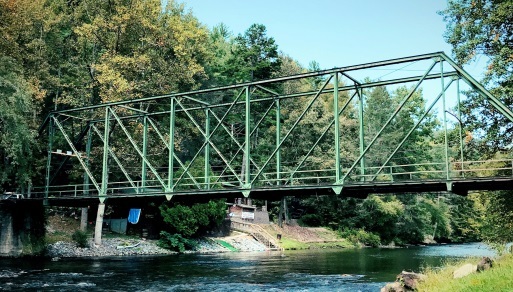 The annual Rivers Alive Toccoa River Cleanup is beginning to see some long-term change in how people treat the Toccoa as a dump site where river currents will miraculously move trash downstream without harming fish, plants and humans. Beth Skillman, the local River’s Alive Coordinator, said that we are pulling out less trash each year. Previous river clean-ups had to dig large trash items out of the river because the items had been there so long that they were sunk in the mud. Now the items are more like everyday trash that can be wrestled from limbs. Skillman also attributes less trash in the water to public education campaigns about river health at schools and among the general public. 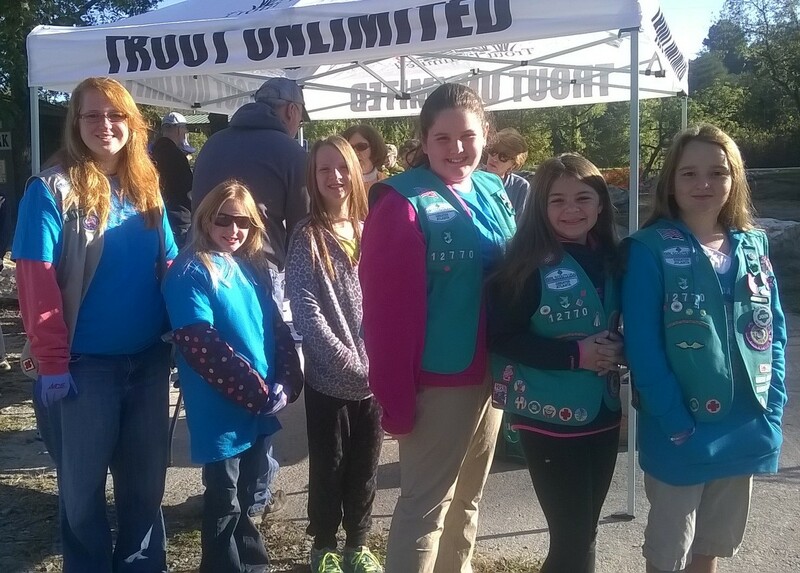 Fannin County Girl Scouts added points towards their badges by helping with the Toccoa cleanup. Several Fannin Girl Scout Troops joined in the cleanup. This year, their area was Horseshoe Bend Park. There they found lots of party and cigarette mess, fireworks and rotten food thrown down the banks said the Troop leader. When asked why they came to the cleanup, one Girl Scout said, “It helps God’s beautiful creation.” The girls did make a “pretty cool” find during the cleanup – a four-foot long snakeskin. Faith Presbyterian was there as well. Pastor Dr. John Simpson said that volunteering at events like Rivers Alive is part of Presbyterians’ public faith that cares about what happens in society and community. “We care for creation. We care for the environment,” said Simpson. 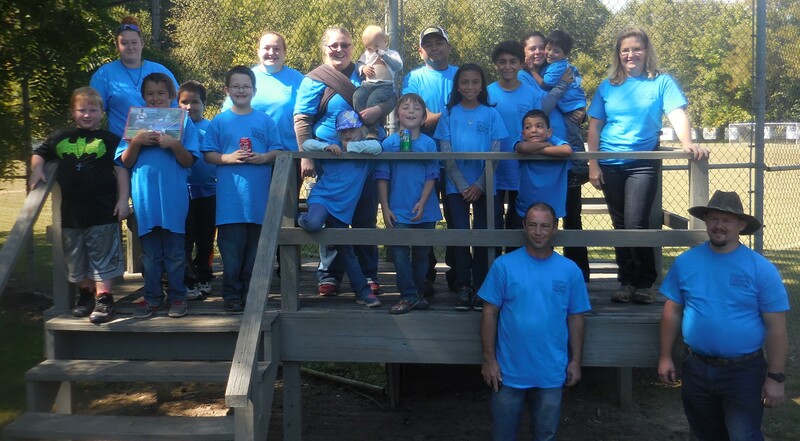 Cub Scout Pack 432 from Epworth brought along friends and family to help in the cleanup. Cub Scout Pack 432 out of Epworth came with a host of siblings and parents to clean out the Dry Branck Creek Day Use Area. There they found broken bottles, two four-inch PVC pipes and fishing lines, lures and hooks. 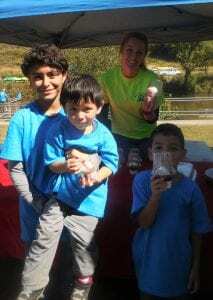 Ashya Brooks of Blue Ridge’s Dairy Queen serves ice cream to the Saldana family at the cleanup. Dairy Queen and Walmart were there to support cleanup by providing food and dessert for the volunteers. Dairy Queen supports many events around Fannin County. FetchYourNews asked Ashya Brooks, Community Support Manager for Blue Ridge’s Dairy Queen, why the franchise supported so many events. Brooks said that Dairy Queen likes to support the community because it shows its employees and customers that Dairy Queen cares. Lake Blue Ridge Civic Association and Trout Unlimited were also involved in organizing the cleanup. Beth Skillman, the local organizer for Rivers Alive, can help organizations set up their own river cleanups throughout the year. Organizations can contact her at skillmanba@yahoo.com. 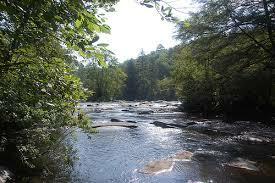 The Toccoa River is the heart of nature in Fannin County. 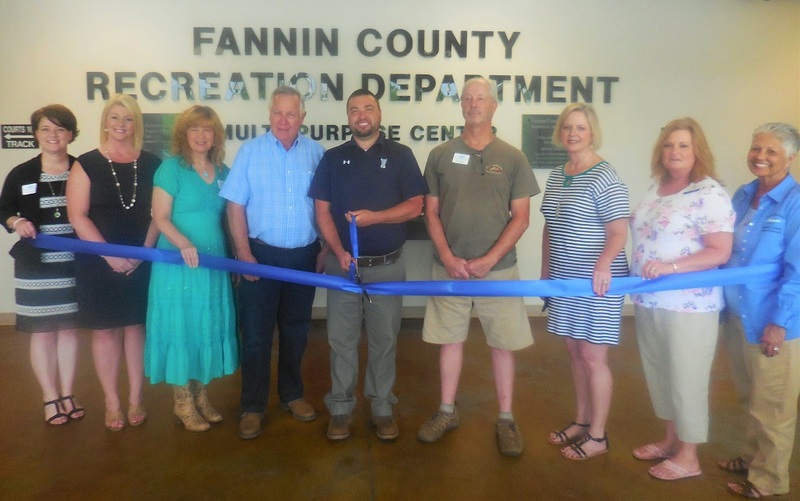 On Oct. 1st , Fannin residents and Toccoa River enthusiasts will gather together to thank the Toccoa for the pleasure it gives by taking the trash out of the river and Lake Blue Ridge. Oct. 1st is annual Rivers Alive cleanup beginning at Tammen Park. There, between 8:45 and 9:00 am, volunteers will check in, get a t-shirt, gloves and garbage bags. Ace Hardware is providing gloves and trash pick-up sticks. Then the volunteers will break into groups and head off to Weaver Creak, Toccoa tailwaters, Deep Hole, Shallowford Bridge and other locations along the river and its feeder stream. The largest group will walk the parts of Lake Blue Ridge shoreline. 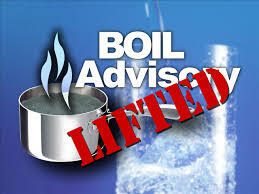 TVA will not release water during the river cleanup event. Volunteers should bring water and extra trash bags. Rivers Alive also encourages boaters to bring their boats, kayaks and canoes to help with the trash within the river bed and lake. At noon, volunteers will gather again at Tammen Park for lunch and the trash count. Wal-mart is donating the food, Mercier apples and Blue Ridge Dairy Queen sundaes. Faith Presbyterian and Trout Unlimited have donated the logistics of the whole event. 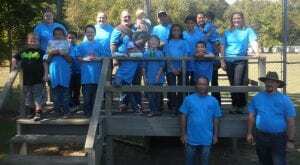 Rivers Alive has been holding its annual fall Toccoa cleanup for over 10 years. The amount of participants has grown to 120 – 130 within the past few years. In past cleanups, people gathered items like toasters, model airplanes and, one time, even a porcelain toilet. If you or your organization would like more information about how to volunteer, call Beth Skillman, the Rivers Alive chair at 770-833-8637 or at skillmanba@yahoo.com. 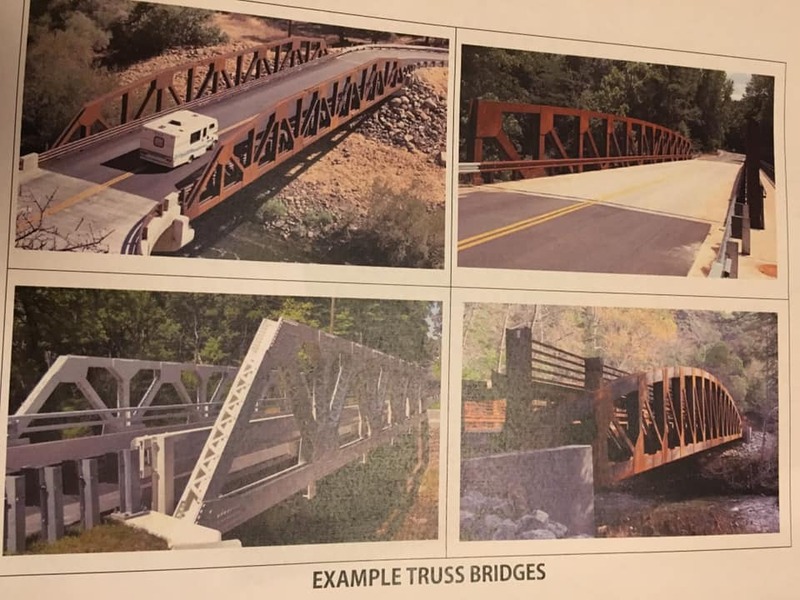 The parties of the Aska Rapids Case won a reprieve this week, as Judge Brenda Weaver gave the parties involved another thirty days to negotiate and determine a disputed property line. 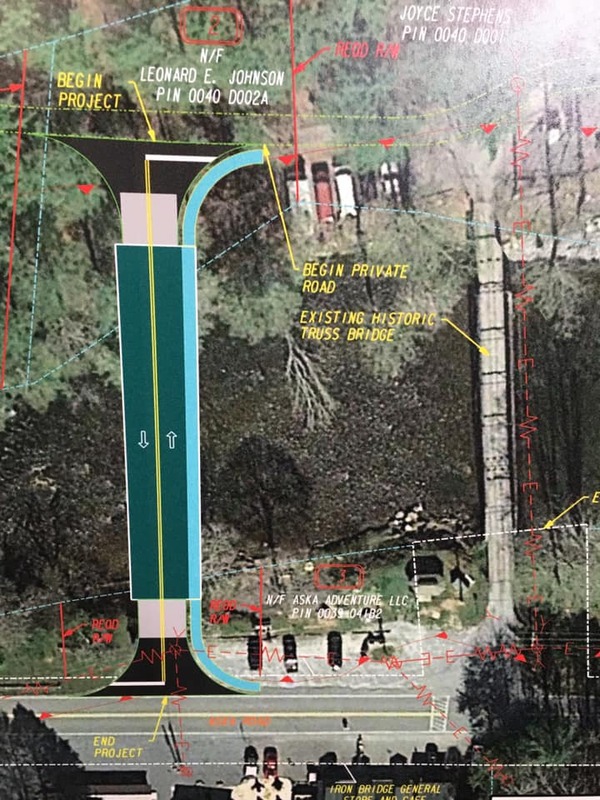 « Previous Article Blue Ridge, A Trail and Rink Town?